In the centre of the Italian gardens on Scarborough’s South Cliff is a statue of Mercury. ​It is a replica of a 16th century original by Giambologna, a master of the bronze miniature in the late Renaissance style. Other replicas can be found around the world including the Amsterdam Stock Exchange, in the business district of Osaka in Japan, in Washington DC and Oslo in Norway.The statue can be found in the gardens of stately homes and manor houses around the UK. Mercury was one of the major Roman gods, he is the god of financial gain, abundance, commercial eloquence and success. His image can be found on bank notes and on the façades of banks and other financial institutions around the world. 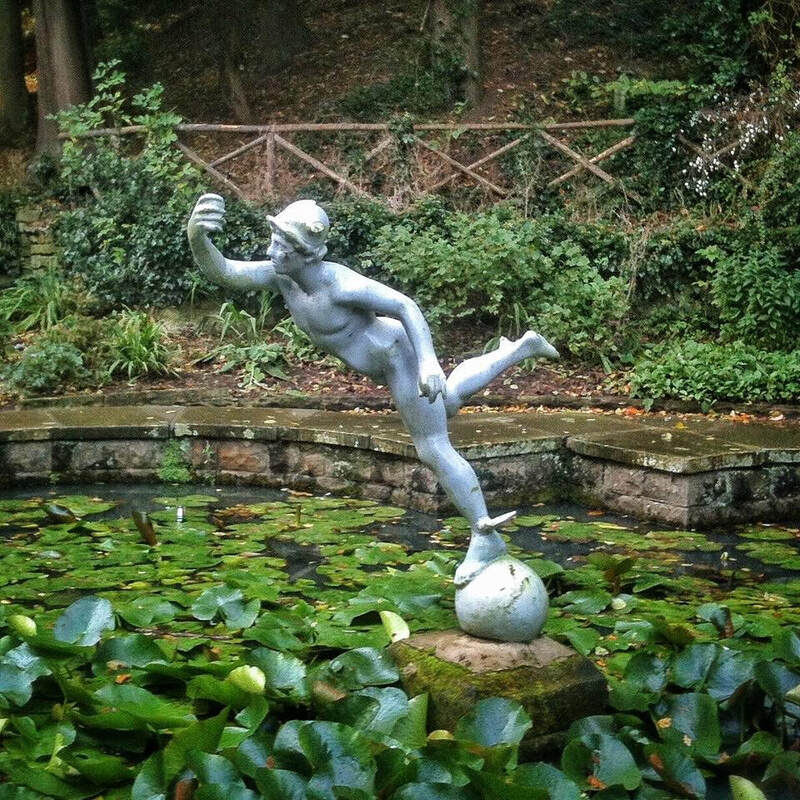 The original Mercury statue was sculpted in 1580 and decorated the fountain of the sumptuous garden at Villa de Medici in Rome. It was moved to Uffizi Museum in Florence in 1780 and then to the Bargello Museum in Florence in 1865. It is the most celebrated statue by Giambologna (1529-1608). Casts from the original moulds were used by the Heritage Marinelli foundry in Italy to make official copies when the sculpture became popular in the 19th century. The original statue was made as a diplomatic gift for Maximilian II, who was Holy Roman Emperor and king of Bohemia. He considered Mercury as his protector and images of the god, based on Giambologna’s statue, appeared on his coins. The original statue in its original setting at the Villa de Medici is set on a mandala-shaped pond. This pattern has been copied in the style of the ponds in the Italian gardens and Peasholm Glen where Scarborough’s Mercury statues are located. The original statue of Mercury was intended to be set in water around its base to give an airy and floating aspect to the heavy bronze kept afloat by the wind. The statue cast in the Italian gardens originally had a golden caduceus wand or staff, a symbol used in classical antiquity and alchemy to symbolise transformation and commerce. The statue could have been collected by Alderman George Lord Beeforth, a successful art dealer and Scarborough resident. He lived at the Belvedere on the Esplanade. The nearby Belvedere gardens, which form part of the Italian Gardens, were the extensive grounds of his house. They are linked by a private tunnel under the Esplanade. A resin cast of the Mercury statue in the Italian gardens was made to replace a statue of an angel, which was the original statue in the lily pond at Peasholm Glen. Maybe this angel statue was also part of Beeforth’s collection? In the Italian gardens, the statue of Mercury stands, poised on one foot, assuming an arabesque pose, supported by a zephyr - a slight, favourable, westerly breeze - while he points his finger upward to Jupiter, the supreme god in the Roman pantheon. Giambologna was influenced by Michelangelo and the statue of Mercury’s right arm pointing to Jupiter is thought to reflect the hand and finger pose seen in The Creation of Adam. The theme was inspired by the medieval Latin hymn, Veni Creator Spiritus, which asks the finger of the paternal right hand to be given to the faithful. God's right arm is outstretched to impart the spark of life from his finger into that of Adam and, in the case of the statue of Mercury, to his father Jupiter. It is the symbol of eternal growth and inspiration. In palmistry, the index finger of the right hand is the Jupiter finger. Immediately below it on the palm is the mound of Jupiter. The prominence of this area of the hand is said to be an indicator of success. The cast of the statue in the Italian gardens is missing the finger and the zephyr has been replaced with a football. Mercury’s modesty is also politely preserved in this casting, a necessary formality for polite society in the 19th century. For example, when the 17ft casting of Michelangelo’s David was presented by the Grand Duke of Tuscany to Victoria in 1857, the queen was so shocked by the statue’s modesty that a two-foot fig leaf was swiftly commissioned to cover it up, in readiness for any future royal visits. The fig leaf is no longer displayed on Michelangelo’s statue of David but can still be viewed, on display in its own case, at the back of the statue’s plinth in the Victoria and Albert Museum.